It’s funny; people get so up in arms about Ghostbusters and Point Break being remade, yet nobody bats an eyelid when Pete’s Dragon gets an update. Part of that is possibly because the original 1977 movie wasn’t very good, remembered only for having a Roger Rabbit-style animated dragon within the otherwise live-action movie, and almost nothing else (though from what we have seen of it, it looks extremely naff even for a 1970s Disney film). Whenever it’s a case like this where a forgettable film is remade for a newer audience, not dissimilar to True Grit or Ocean’s Eleven, the newer version is often a far superior product to the original, and we’re going to take a wild guess that this is also true for the new and updated version of Pete’s Dragon. 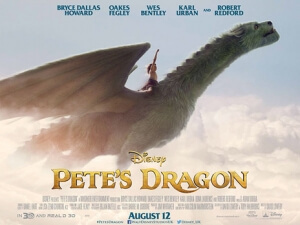 Much like the original, it’s a story about a boy named Pete (here played by Oakes Fegley) and a giant green dragon nicknamed Elliott that can turn invisible – and that’s where the similarities end, because this is an entirely different beast altogether. In this version, young Pete is left alone in the woods after his parents die in a car accident, and is raised over the next six years by Elliott as a wild and feral creature. Naturally, he soon comes across his own kind, including friendly ranger Grace (Bryce Dallas Howard), her step-daughter Natalie (Oona Laurence) and her father (Robert Redford) who claims to have also seen a dragon in the past. They take Pete in, but the boy’s desire to be reunited with his winged friend attracts the attention of hunter Gavin (Karl Urban) who becomes determined to capture the dragon at any cost. Director and co-writer David Lowery seems determined to remove this as far away as possible from its more sugary predecessor, and construct it as a mini-homage to a classic Spielberg movie instead. It isn’t updated too much, however, as there’s (thankfully) not a smartphone, laptop, iPod et al in sight which, much like The Peanuts Movie, means that the timelessness of the story and characters is able to shine right through and not let anything instantly date it. The pacing, though it does meander slightly near the beginning, also takes its time to establish the kindly relationship between Pete and Elliott as well as the other characters, and while the dragon himself never utters a word of dialogue he speaks volumes as a character through some impressive (if a little cartoonish) visual effects work by Weta Digital. It also adopts a very grounded tone, adding the right amount of human drama and fantasy to not let either one outweigh the other. In a comparison we never thought we’d make, it shares some similarities to Room, with young Pete here struggling with the same desires to return to his unusual and uninhabitable living conditions as Jacob Tremblay did in that film. Of course, this is a much more light-hearted film than Room, but our point is that it shares some very deep similarities in terms to child psychology, especially when they have been raised in an environment different than our own. It’s actually quite a dark subtext when you really think about it, at least for a Disney movie, but it doesn’t detract from the film’s overall focus on heart, friendship and humanity that most kids’ films would beg to have for their own. The story is strong, even though as it approaches the third act it threatens to become too conventional; the cast all give solid performances, particularly young Oakes Fegley as Pete and Karl Urban who’s always fun to watch in anything; and visually it looks absolutely stunning, with Lowery and cinematographer Bojan Bazelli giving it the look of an indie film with the spirit and warmth of an 80s Spielberg movie (the forest scenes in particular are beautifully lit and shot). There’s simply a lot to like about this new version of Pete’s Dragon, with children bound to enjoy the antics that Pete and Elliott get themselves into, and adults finding warmth and soul in its strong sense of heart. It’s yet another hit for Disney, which is so far having a truly spectacular year with Zootropolis, The Jungle Book and Finding Dory all scoring high with critics and audiences. Glad to see that Pete’s Dragon doesn’t buck the trend, and before this superior remake we never thought we’d say those words. Pete’s Dragon is a soulful, heartfelt, and often superior remake of the Disney classic, keeping to a grounded tone and steady pace that allows for the character development and stunning visuals to become just as magical as the dragon itself.